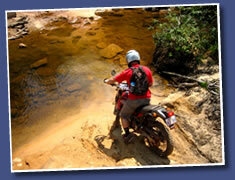 Jungle Cross has been providing off-road motorcycling adventure tours of the Cambodian jungle for the past 7 years. Now operating from Safari World casino near the Thai-Cambodian border at Koh Kong (Google Map), Jungle Cross provides tours following routes into the Cardamon Mountains which contains 3 national parks. 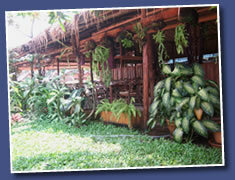 The tours take in a huge diversity of wildlife and terrain across 2 million hectares of jungle and rugged wilderness. From the moment you enter the country, Jungle Cross will guide you and take care of your every need whilst you experience riding through this truly unique part of the world. Nick Berry started riding motorbikes when he was 13 years old and went on to set up his own scooter shop in Kentish Town, London aged 17. Nick then went on to become a professional salvage diver traveling all over the world and diving in places such as the Caribbean, the Canary Islands and Kenya for 6 years. After a further 11 years diving in Spain, Nick then went traveling in South East Asia. 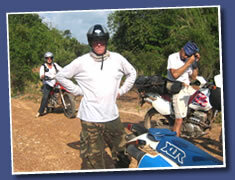 It was during this time that Nick decided to hire a trail bike and ride off into the jungle.... and never looked back! Nick Berry has now been riding in South East Asia for 11 years, and founded Jungle Cross 7 years ago in order to introduce others to the beauty and wonder of the Cardamon mountains. Nick lives near Safari World by the Cambodian-Thai border with his partner Coralie - 3 minutes walk from the border. 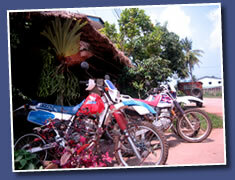 Jungle Cross maintains a fleet of 7 Honda XR and Suzuki DR 250 Enduro bikes. These bikes have been, tried, tested and selected as the best vehicles for the terrain encountered on the various tour routes. All running costs, including fuel are inclusive, and crash helmets are provided. It is strongly advised that you provide your own boots, gloves, and other protective clothing. Click here for further info on how to get to Junglecross.